Did Joel Embiid deserve to be ejected for this elbow? 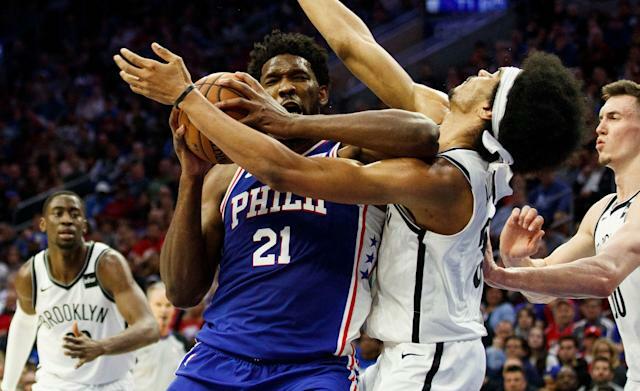 Should Joel Embiid have been ejected for this elbow to Jarrett Allen's face? Jarrett Allen has a stronger jaw than most heavyweight boxers. The Brooklyn Nets center took the hardest of elbows from Philadelphia 76ers counterpart Joel Embiid in the final minute of a closely contested first half. Allen fell to the ground before getting up and receiving sideline treatment for a bloody lip. Meanwhile, referees reviewed the foul from Embiid, ultimately calling a Flagrant 1 — resulting in a pair of free throws for Allen, who made both to draw the score even at 64-64. The Sixers star could be seen questioning the call, but he was lucky to avoid a Flagrant 2 and automatic ejection in Game 2 of a series Philadelphia trails 1-0. The NBA defines a Flagrant 1 foul as “unnecessary contact committed by a player against an opponent,” but a Flagrant 2 adds “excessive” to that unnecessary contact. If refs determined Embiid’s foul to be unnecessary, it sure was excessive. At halftime, NBA on TNT analysts Charles Barkley and Shaquille O’Neal took opposite sides of the argument. Barkley believed Embiid threw the elbow on purpose, thus deserving an ejection. O’Neal, however, suggested that big men are taught to hold their elbows high when they turn to the basket with the ball, and Allen’s jaw just happened to be in the way. Fellow analyst Kenny Smith initially agreed with Barkley, and then sided with O’Neal. There was some ambiguity here. Embiid did appear to raise his elbow into Allen’s face as he turned toward him. Allen had thrown down an alley-oop dunk on Embiid less than two minutes earlier. It sure seemed like Nets wing Rodions Kurucs felt as if Embiid’s elbow was intentional, since he threw a less punishing blow to Sixers star Ben Simmons’ face on Philadelphia’s next offensive possession, drawing a Flagrant 1 foul of his own. Rodions Kurucs on Ben Simmons: He plays hard, and I play hard. Also, I don’t like that he said in the media that JD (Jared Dudley) is guarding him and ‘that kid.’ Now, I want to let him know that he knows my name. I’ll play hard. I’ll go at him, and I’m not scared of him. Kurucs’ elbow gave Philly one point back and a 65-64 lead at the half. Embiid scored the first seven points of the second half, as the Sixers began the third quarter on a 21-2 run that gave them a healthy cushion in a must-win(ish) Game 2.